If you want to economize on your spending online, you should just stop buying so much. If an application like Browser_Apps says that it can help you purchase various goods at an optimal price, you should stop and think twice before using it. 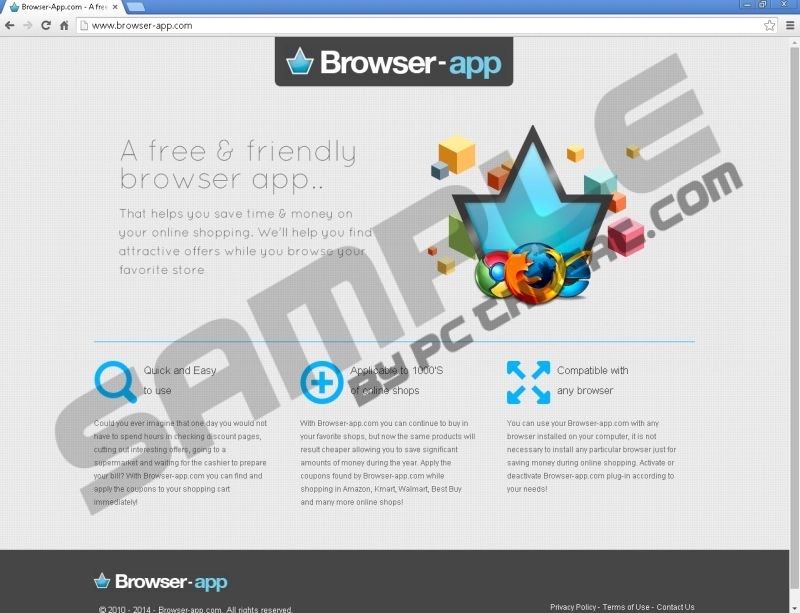 Browser_Apps cannot be trusted because it is an adware application that collects data on your web browsing activities. Computer security experts recommend removing Browser_Apps as soon as you can. There is no need to keep this extension on your computer because it does not keep its promises. Even worse – it might expose you to potentially malicious content. Users seldom realize that Browser_Apps is not reliable because when you check its background, it turns out that the program has an official webpage via browser-app.com. However, when a program has an official homepage, it should be possible to download it directly, yet that is not the case with Browser_Apps. The direct download link is unavailable, and we are left with just one option of distribution – bundled downloads. According to our security research, Browser_Apps is usually bundled with fake flash player installers. Users encounter fake notifications about the necessity to update their flash players online on a regular basis. Nevertheless, you should know that downloading updates from unfamiliar websites is extremely dangerous because it may lead to Browser_Apps installation, and even malware infiltration. Therefore, download programs from their official homepages only, and do not forget to perform regular system security scans, just to make sure everything is OK.
As far as the origins of Browser_Apps are concerned, this program is built on Crossrider engine. This fact puts the application into the same group as Savings wave, CrossReader, Delve and an entire list of other unwanted applications you should avoid. At the same time, we can breathe a sigh of relief because Browser_Apps is not a malicious computer infection, and it is not hard to remove it. Adware programs should not be trusted because they can be easily exploited by malevolent third parties. Browser_Apps is of no exception. It may seem that it can provide you with coupons and discount offers, but the ad content is not 100% safe. Browser_Apps may outsource the link content from third-party advertising servers, and the problem is that the extension does not review whether links are safe or not. It means that by clicking Browser_Apps ads you risk potential malware infection or personal data leak. You need to avoid that at all costs, so removing Browser_Apps is a must. After manual removal, you should also perform a full system scan with a reliable antispyware application because there is a high chance you have more than just one unwanted application on board. Keep your computer safe and, do not hesitate to leave us a comment if you have any further questions. Open Uninstall a program and remove Browser_Apps. Select Uninstall a program and remove Browser_Apps. Select Add or remove programs and uninstall Browser_Apps. Quick & tested solution for Browser_Apps removal.